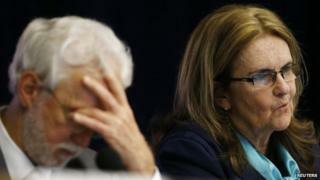 Image caption Petrobras CEO, Graca Foster said "We want to turn this difficult moment into something better." The head of Brazil's state-owned oil company, Petrobras, Graca Foster, promised to improve the way it is is run as it struggles to deal with a huge corruption scandal. Ms Foster said the company would create a compliance division to track internal processes. On Friday 23 people were arrested on suspicion of money-laundering and corruption. Among them were executives of Brazil's biggest construction companies. "We are going through a very difficult moment in the company, but we are convinced that we will have better management after we structure and implement all of these managerial processes," said Graca Foster. The scandal was a sensitive issue for Brazil's President Dilma Rousseff in last month's presidential election. She was challenged several times over the issue and has said she had no knowledge of the kickback scheme which allegedly paid out to several political parties, including her own ruling Workers Party. She was forced to admit there was evidence of wrongdoing at the company and has promised to try to reimburse Brazilians for the public money that was taken. President Rousseff chaired the board of directors of Petrobras from 2003 to 2010. On Sunday she said the investigations into Petrobras, could change the country forever. "It is a symbolic case for Brazil," she said. "This will change forever the relationship between Brazilian society, the Brazilian state and private companies." President Rousseff said all agreements between Petrobras and the company's contractors would be investigated. She said the investigation would target individuals rather than the companies themselves. Image caption The scandal has spread to several political parties including Dilma Rousseff's own ruling Worker's Party. Petrobras, which is majority-owned by the Brazilian government, is one of the largest oil businesses in the world with interests in Asia, Africa and the Middle East. The investigation began earlier this year when a former executive, Paulo Roberto Costa, alleged that one of its departments paid millions of dollars in bribes to politicians, including members of the governing Workers Party. Costa, who was arrested in March, has alleged that the refinery division of the company operated a fund that diverted money to political parties. The resulting probe, codenamed "Car Wash", has led to raids in Parana, Sao Paulo, Rio de Janeiro, Minas Gerais and Pernambuco, as well as Brasilia.